This month’s athlete spotlight is a professional Freerunner, he has a 4th degree black belt in Taekwondo, and is a WFPF Master Instructor: Fernando Arce. Arce got his start in Parkour over a decade ago when his cousin showed him a YouTube video and recommended he try it – needless to say, he became hooked. Arce began training 5-6 days a week for up to 5 hours a day! 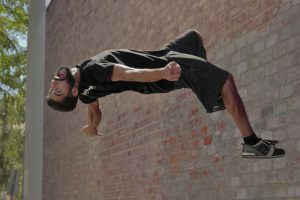 He notes that the combination of his 20+ years of Taekwondo and 12+ years of track and field “ended up being a great layout for a Parkour athlete” and “helped tremendously with the different plyometric workouts, and body / air awareness.” While not many people have as extensive of martial arts background (if any) when beginning Parkour, Arce recommends to “start with the basics,” and even seek out a coach or mentor to ensure correct form and safe practices. In addition to the physicality of the sport, Arce believes the other ingredients in the recipe for a great Parkour athlete are discipline, self-confidence and perseverance. Trust me, take his advice! Start where you are, with what you have; set your goal, train consistently, and most importantly: believe in yourself! We asked Fernando which superhero he relates to most, his answer was Spider-Man. Without a doubt because of “his agility, quick twitch muscle fibers, and his ability to flip in the air at great heights without hurting himself on his landings.” If you’ve seen any of his content, Arce’s skill and movement style truly is superhuman. Even with their superhero talents, elite Parkour athletes are not impervious to fear. Arce recounts one occasion when he was crossing a gap from a parking structure wall to a lower building. He recalls, “at the starting mark on the wall I would have to get down when a group of people or cars would go by. I did not want to draw attention to myself at that magnitude.” Arce prepared to face his fear of the gap by envisaging himself completing the jump. He tells us, “I played the scenario of myself completing the jump, visualizing what do with my body midair and imagining the timing of the landing over and over in my head until I felt comfortable with myself physically and mentally.” He notes that it took him nearly 20 minutes to mentally prepare for this jump, and to this day, every time he goes back to that location he thinks, “how did you do that? !” This exemplifies how the sport of Parkour not only trains your body, but your mind – building mental strength and self-confidence that is paramount in all aspects of life. What does Fernando’s physical training look like now? He currently trains 2-3 days a week for up to 3 hours per day. He varies his training depending on the day and location. He normally warms up with jogging, some jumps, and if he’s in a gym he will utilize the trampoline. Arce begins with basic flips, progressing in difficulty until he gets to the point when he’s focusing on certain goal skills. When outdoors, he lets the location dictate his training, “observing the environment and coming up with fun ideas to link together for a line.” To ensure he is able to perform at his optimal level, Arce makes sure to have at least 3 solid meals, and stays hydrated with water throughout the day. In addition to his training, Arce is creating full-length videos for YouTube, and works on honing difficult skills to take to future competitions. Documenting your journey with videos is a useful tool to measure progress. Before his training sessions, Fernando says he reviews previous videos to “remind myself all that I am capable of and watch the latest Parkour videos on YouTube for inspiration and creativity.” Aside from training, Arce takes part in live performances and commercials. 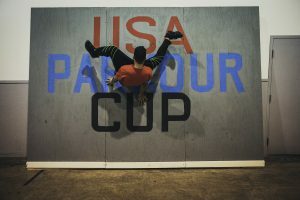 Most recently, Fernando hosted the 2019 WFPF USA Parkour Cup, providing awesome energy, commentary and jokes. All around, Fernando Arce is an incredible athlete, constantly encouraging and inspiring those around him. With his talent and years of experience, he continues to pay it forward as a Parkour coach, teaching Parkour and ushering in the next generation of athletes.